Very excited that Tangles will be published this month in France by Steinkis Editions! It will also be distributed in Quebec by Flammarion. Steinkis changed the cover design and I like it a lot. Last week I went to New York City for a few days. In between eating (Stinky Brooklyn, Shelsky’s Smoked Fish, Eataly — oy vey!) and visiting my lovely American family, I managed to get to this great symposium where I’d been invited to talk about Tangles: Talking About Jewish Women and Comics. 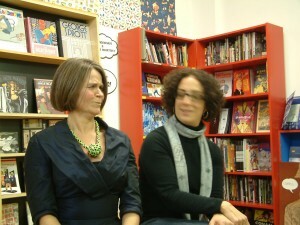 What a thrill to see Diane Noomin and Miriam Katin in person and hear them talk about their work! Not to mention the Graphic Details exhibit that was the basis for the symposium — original artwork by Noomin, Katin, Trina Robbins, Aline Kominsky Crumb, Corinne Pearlman and more… sigh. Felt like a fan girl — albeit one with grey hair creeping in and smoked fish breath. 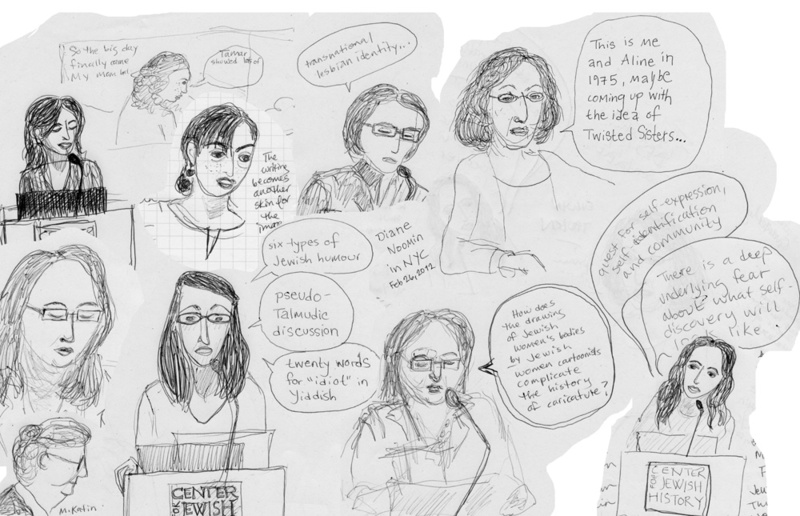 These are some drawings I did of the speakers — Noomin, Katin and unnamed academics. As I’ve mentioned earlier, Nicola wrote/drew Billy, Me & You, and is also co-creator of Laydeez do Comics. So amazing that I got to meet her and talk to her! And even make fun of her silly version of a Canadian accent. Long live traumatic autobiographical comics by Laydeez! Thanks to Ian McGillis for the promo for my Montreal reading this coming Thursday at The Yellow Door Coffeehouse, 3625 Aylmer, on Thursday, July 21 at 6pm. Admission is free…. The first work of Canadian graphic literature to be short-listed for a major mainstream prize (the Writer’s Trust of Canada Non-fiction Prize), Tangles is exactly what its subtitle says it is. 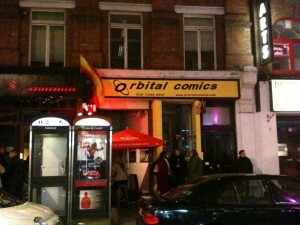 I reviewed it in The Gazette last winter. (Here’s a link.) The review was a rave and I stand by every word; if anything the book has grown in my estimation, rooting itself in my memory where many books I’ve read in the interim are already gone. Its greatest strength is its tacit acknowledgement that subject like Alzheimer’s, if it’s going to be tackled at all, is best dealt with head-on. Leavitt spares nothing of her mother’s suffering, nor of her own complicated response and handling of it, and in so doing does all who have been and will be involved in such struggles a great service. It’s not hard to imagine that things could get emotional at a reading from such a book, so bring a few tissues. Whirlwind tour coming up! Excited! I will now do my best to write a brief report on the Comics & Medicine conference without using “OMG,” “awesome,” or excessive exclamation marks. We’ll see how I do. For months now I have been both looking forward to and completely stressed out about this conference. 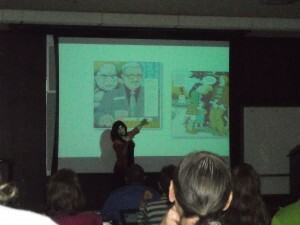 Here’s why I was looking forward: I kept thinking about how Comics & Medicine was not only (ha!) 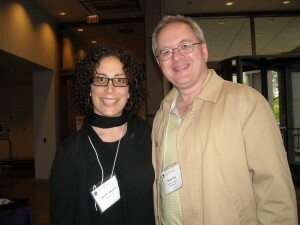 a gathering of cartoonists, doctors, nurses, academics, and other extremely interesting people; it would be my first time meeting Brian Fies, author of Mom’s Cancer, who has supported me since I emailed him in 2009 to get advice on publishing a graphic memoir about illness; a chance to meet MK Czerwiec, who writes and draws the Comic Nurse comics and who I could tell was awesome cool after just a brief email correspondence; and a chance to rub shoulders with people I had huge admiration for, like Scott McCloud, Paul Gravett and Phoebe Gloeckner. And here’s why I was stressing out: everything I just said! Plus, I was preparing for a panel presentation and a workshop, and I was convinced I had no idea what I was talking about. In fact, I had realized that I was a fake cartoonist, with no talent and nothing interesting to say. So it was wonderful when not only did nothing bad happen, but, to put it mildly, the conference was a brilliant weekend of electric connections, artistic and intellectual stimulation, laughter (the kind that happens over drinks and shared stories of beloved parents with dementia) and self-reflection. OMG OMG OMG!!!!!! Meeting Brian for the first time, at the opening night reception. We became BFFs right away, which was a true act of bravery on his part, because I looked a bit crazy I was so excited! This is a page from Tangles at the art exhibit at the opening reception. Wine did not reduce my extreme, vibrating excitement. 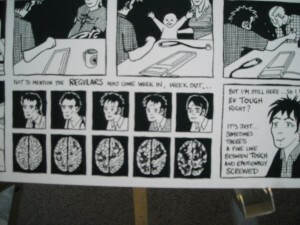 Brian introduced me to Scott McCloud, once I got over my shyness. Scott was very nice and chatty and normal, and even wore a checked shirt! These are just some of the photos I took. 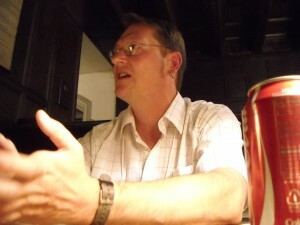 For more from the conference, see Brian Fies’s blog. 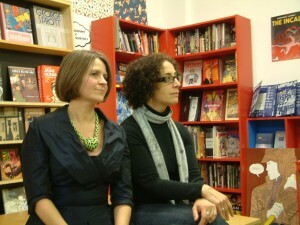 And keep an eye out for updates on the Graphic Medicine website. I will end with two of my 100 architectural photos, from the delicious day and a half I spent wandering the city with MK Czerwiec and Paul Gravett after the conference was over. 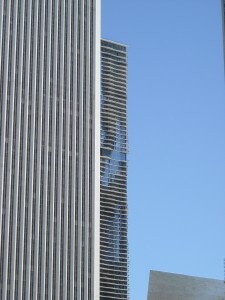 The Aqua Building by Jeanne Gang. 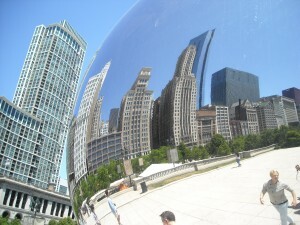 Cloud Gate by Anish Kapoor, amazing outdoor sculpture. 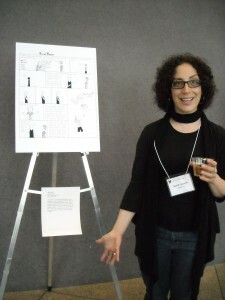 Sarah at Graphic Medicine Conference in Chicago! This is going to be great! 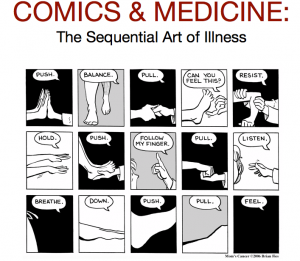 I’m going to Chicago for the second Graphic Medicine conference: COMICS & MEDICINE: The Sequential Art of Illness, June 9-11. First of all, I will finally meet the wonderful Brian Fies, who has been extremely kind and supportive since I first contacted him when my agent and I were shopping Tangles around. Cannot wait! 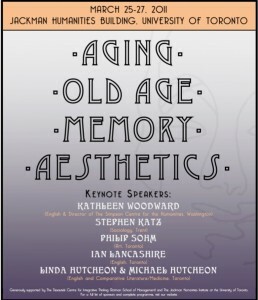 And, hello, I get to go to a conference where Scott McCloud is a keynote speaker. 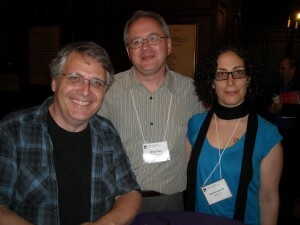 Scott McCloud! And Phoebe Gloeckner! Anyway, I am going to deliver a paper (!) 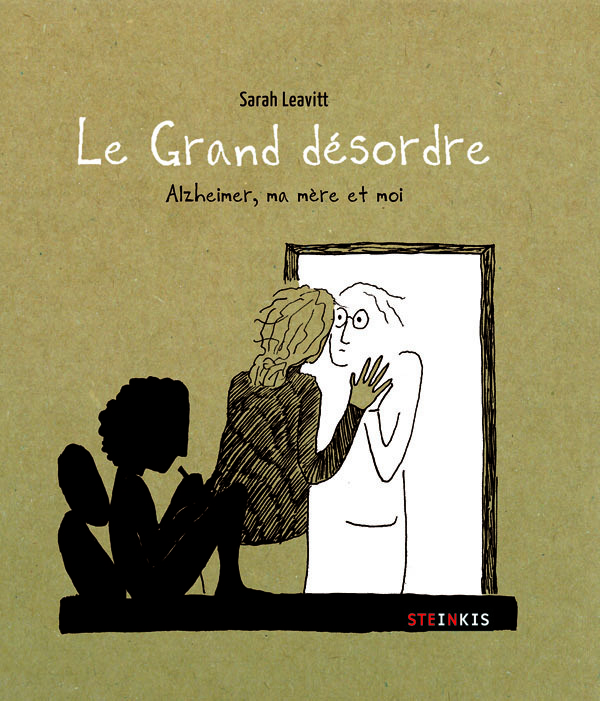 “Documenting a family’s struggle with Alzheimer’s Disease: from sketchbook to graphic memoir,” and lead a workshop, “From diary to graphic narrative: finding the story in your personal experience.” It is all going to be ridiculously awesome. And check out the conference graphic, from Brian Fies’s book Mom’s Cancer. In just over a month I’ll be heading for beautiful Banff, where I haven’t been since the summer of 1977, when my mom and dad packed us all into our maroon station wagon and drove from Maine to Washington. Instead of going on a guided horseback ride and holding up the entire group by bursting into tears because my horse scared me, I will be delivering a workshop for my fellow non-fiction writers about graphic memoir. It might be a little less scary. See the conference program on the Creative Non Fiction Collective website. Tangles will be given as a gift to keynote speakers at this conference and promoted to attendees. Just reading the program — it’s a whole fascinating world of academia that I never knew about… I wish I could check out some of the workshops!